In 2019, blog commenting still works. But, you have to be a real human being while commenting on other sites (as there are plenty of WordPress plugins to prevent comment spamming) and you must have to provide value to that site so that the Admin/Site Owner allows your comment and publish. Step 2: Scan the content (It’s better to read the sub-headings of the post/article) to understand the gist or essence. Step 3: Mention the post owner like “Hi Jhon” and then share your opinion. Step 4: In the name box, always use your Name (not any keyword or stuff). Step 5: Fill up any captcha (if it exists) and then publish your comment. – How to find blogs that allow commenting. – What type of comments usually become allowed. – How to find Gov & Edu sites for commenting. – Different “Search Phrases” to use to find websites that are relevant to your Keyword. Just copy any of the query line from below and change the word between “” (quotation mark) with your keyword or niche and then search on Google. Really great video content and people will get very authentic and helpful information from your post. Just one think I would like to add with you that is when you write down something and search in Google you should Zoom them then we will get very easily otherwise that is really tough to catch you. I am really grateful to you for your great job and thanks a lot for sharing with us. Thank You Basar vai for your suggestions. I will definitely utilise the Pan and Zooming features at my next tutorial. Search Console er index……..din din sudhu kome jasse……….ata kno hosse keo ki aktu somadhan dite paren??? ১। ওয়াডপ্রেসে কমেন্ট গুলি কি নো ফলো হয় না ডু ফোলো ? ২। এইটি কি সব ওয়াডপ্রেসে একই হবে ? না এডমিন চাইলে নোফলো করে দিবে ? ৩। NoDoFollow এড অনন্স দিয়ে দেখলাম এইটা নোফলো (শিউর না) নোফলোর কারনে blog এর ক্ষতি হবে ? 1. Basically the comments links are nofollowed by default. 3. Nofollow won’t harm your blog anyway. Don’t worry. 4. WordPress.com (free blog) and .org (self hosted blog) own kinds of similar type of comment section. In addition, if you are focused on building backlinks from comments; then this is a bad idea. Better, forget about Dofollow and Nofollow stuffs and keep building quality backlinks from different sources like (commenting, guest posting, web 2.0 sites, social bookmarking and sharing and so on). 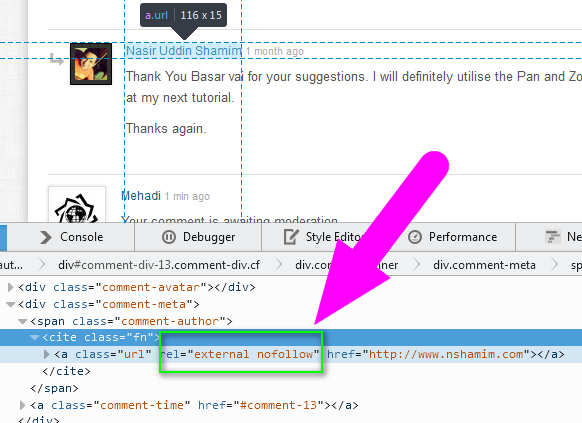 Please mention how can I make dofollow in wordpress comments. These days, while you comment; don’t only go for dofollow comments. It hurts and looks unnatural to Google eye. Better, focus on quality comments and adds value to the websites where you are commenting. This works. Nofollow, dofollow combination is what is strongly suggested. Nofollow links are those links which the search engines do not follow. A combination of Dofollow Backlinks and Nofollow backlinks look natural and Google wants you to keep the SEO thing natural, always.Period. After watching your all videos now i can research keyword . Thank you for creating this platform for us . I am glad to know that it worked for you. Best luck. The videos are very good to make me clear about Keyword research. Thank you author for such a nice collection. Hi,,,you present nicely about how leave comment into one’s blogger site..
Also each and every content of this site is essential and effective for those who is interested in..knowing unknown….. Help me please,,, in my free blog I’d uploaded free template but I cat’t understand that, how I manage a post under that menu bar or how I add a post or page under sub menu…..
You can do it using iframe. Adsense is impossible for bangla portal. Some bangla portal using adsense from third party media. Thanks for this video. I have learned huge knowledge from here. I am waiting for your updates. hello brother your all tutorial is very good and useful for me,but i have one question what is relationship between spamming and blog commenting.if l leave the relevant comment in relevant site is it spamming? I am not a good writer so sorry for that. I have one question what is the relationship between blog commenting and spamming.If i leave the relevant comment in relevant site is it spamming ? Nope, it would be okay. Just comment on relevant blogs to your niche. If you can add value to the article you are commenting; then this is not commenting. While commenting just add value to that article by inputing something real and enticing. Really great video content and people will get very authentic and helpful information from your post. Just one think I would like to add with you that is when you write down something and search in Google you should Zoom them then we will get very easily otherwise that is really tough to catch you. tnx vaia onek helpful ai tutorial gula.aro secret bisoy nia tutorial banabe asa korci.. I watch your tutorials regularly.I guess your tutorials are the best for SEO learners. I have a question.I am learning SEO and trying to rank a website on Google 1st page. My question is what is the probably best solution in building a backlink for a keyword from the next two ways? I would use this in all link building methods. ie, pdf sharing,edu gov link building etc. Hope that I could make you understand. Ranking homepage is comparatively easier than ranking inner pages. If your homepage is optimized for the keyword “unabridged birth certificates” then go for linking to your homepage. And if your homepage is targeted for the seperate keyword rather than this; then target your inner page. Thanks Shamim for nice and informative post share with us. really amazing tutorial that i like. Coz relevant blog commenting is the big thing for seo. I would like to build up my career as a blog commenter . I know process of doing blog commenting. But one thing I would like to know from you- same comment can I use at many sites? or I have to write different comment at different sites? It is very difficult to write huge comment . because we are Bangali, not proficient in English. Copied comment is kind of a plagiarism as well. So, you should avoid it. But still, you can use a good spinning software to fasten your process. Shamim Vai, Thank you so much for giving this awesome blog commenting idea. you are really intelligent. i am always following this website and waiting all the time for your update tutorial. thanks again. Great Blog.It is very useful.Thanks…..
Dear Shamim Bhai I have downloaded the pdf file for searching in google in different way. But there is no such guideline on searching blog commenting site like the way you have searched in this video. I am Totally Confused how i can start to say thanks . Many Many thanks for your Best Blog commenting Idea…. Very informative post sir. keep it going.